Coleraine manager Oran Kearney pictured with new signing Stephen O'Donnell. Oran Kearney has strengthened his defensive options with the capture of Stephen O'Donnell and Aaron Traynor. The duo, who play at centre back and left back respectively, follow Josh Carson as new additions into The Showgrounds. Coleraine manager Oran Kearney pictured with new signing Aaron Traynor. "I'm very pleased to have brought Stephen and Aaron to the club," said the Bannsiders boss. "They were two of the standout players in the Championship last season - Stephen with Institute and Aaron with Warrenpoint Town. "Stephen is a player I have kept a close eye on over the last couple of seasons. "He is very highly thought of and always impressed any time I watched Institute play. "Stephen also has an eye for a goal, I think he maybe got eight last season. That's maybe something we have missed from our defenders in the last couple of years. "He's 24 now and it's a good time for him to make the step up to the Premiership after a successful spell with Institute. 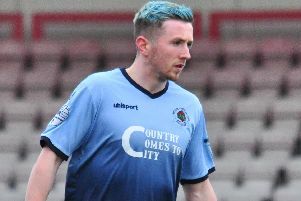 "Aaron is an explosive and powerful full back and played a key role in Warrenpoint's charge to the title. "He was as good a player as there was in the Championship last season, but like Stephen he now feels he wants a crack at a bigger challenge. "As I say I'm very happy to bring both players to the club. It strengthens the squad further, which is important, particularly in defence as we were fortunate we didn't suffer too many injuries or suspensions last season. "My job is to challenge the players we already have at the club by bringing in new additions who will push them all the way for a place in the starting line up. "Competition is healthy for any club and if new players come in and raise the bar then the existing players have to respond by matching their efforts and raising it further." Stephen O'Donnell has signed a two-year contract with Aaron Traynor penning a one-year deal with the option of a second year.